What a great Master of Karate does with an umbrella! How to stop a bully from hurting you! What "Fighting the Invisible Enemy" is! Alertness of mind, self-control and perseverance! An attitude of kindness, consideration, cooperation, and respect—what we call manners! "The mind is like a mirror. It grasps nothing, it expects nothing. It reflects but does not hold. Therefore, one can act without fear." Another important principle of the Art of Karate is called Mind Like Moon—Mind Like Water. It is a basic principle of all forms and styles of the Martial Arts and has more than one meaning. Perhaps you are trying to figure out what it's like to have a mind like the moon. If you picture a full moon on a dark night, you know that the moonlight shines equally on everything within its range. If your mind shines equally on everything within its range, it will be open and aware of all things. In the art of self-defense, it is important that you are constantly aware of all your opponent's movements. With an open mind you can be immediately aware of an attack and you can react without thinking to get out of the way of someone who is trying to harm you. Clouds blocking the light of the moon are like distractions which interfere with the correct and accurate response needed to defend oneself. Do you understand now? But "mind like moon" is much more than a way to avoid an opponent's attack. It means that you must see and understand violence—you must have an open mind to why one would want to do you harm, and you must look at what causes the violence. You would have to think about the hurt, fear, and anger that you feel when you are attacked. You would need to see the reasons why you yourself would want to hurt someone, and you must attempt to understand why you feel hurt. Once you begin to see why you feel hurt, you will begin to understand why someone else gets hurt and why that person might want to hurt back. Then you begin to see what hurt is and how it causes violence. By seeing the problem, you can respond with true understanding, so that you are not merely defending yourself against being attacked physically. Understanding all of this, you can respond with intelligence and choose a more nonviolent, creative way to handle your problem. Now that you have an idea of what it means to have a mind like the moon, perhaps you can guess what it means to have a mind like water. In the self-defense aspect of Karate, "mind like water" is a calm mind like the surface of undisturbed water. Still water, like a mirror, reflects exactly what is there, without any distortion. This state of mind allows you to see an attack and, at the same time, respond to it immediately and accurately. If any distracting thought is allowed to enter the mind, it will be like throwing a stone into the water. The opponent's movements will not be clear and therefore the response will not be quick enough. If the mind is filled with thoughts of attack and defense, it will not correctly understand what the opponent is trying to do. Such unnecessary thought could bring harm to both you and your opponent. There is an even deeper meaning to "mind like water." When the mind is like still water, or a mirror, it reflects what is there without judging it. If the mind is still, silent and deep, it sees exactly what is before it without thinking about what should or should not be, without being concerned whether something is right or wrong, or good or bad. Judging what you see is like stirring a stick in water—it only makes the water muddy. A mind that can understand and intelligently respond to the deeper causes of violence must be clear. Once you achieve this clarity of a still mind, you are then capable of something very special called insight, which is the ability to see, understand and act immediately to handle a problem. In the physical aspect of Karate, this is the ability to act instantly to protect yourself when you are about to be physically attacked. I liked the way this book outlined different situations I might encounter in my daily life as a young kid. It showed me through examples, how to react in a positive manner to the various situations, such as bullying. From reading the book I can better understand what reactions are best when a bully is picking on me. The book discusses good manners and bad manners which is good to know. The book gave me lots of information on the origins of different types of karate. It also gave you suggestions on how to pick out the correct karate school for you. The meanings and translations of various words such as karate (empty hands) was very interesting to me, because even though you may hear the words, you may not always understand the exact meaning. I read this book quite quickly because it held my attention. It is quite different from the regular books I would read, which most often are novels and therefore have main characters. I did like reading this fact-filled book and would recommend it to anyone who is interested in karate or who may be encountering any kind of bullying. My book (Facing the Double-Edged Sword) is not what I was expecting. I thought it would have been about high intense karate situations, but it was really about stopping a fight nonviolently. This book gives information on different ways of stopping fights, like walking away, that doesn't really stop the problem. This book also talks about Zen, a method of finding inner peace, a way of relaxing your mind and clearing it of thoughts. 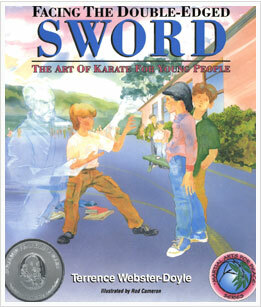 Facing the Double-Edged Sword is trying to teach people that karate is not all violence. It teaches self-control, self-obedience and stamina. Facing the Double-Edged Sword means that either way the sword is facing you will get cut. The book Facing the Double-Edged Sword is about what to do in a fight. The title means when you are in a fight, if you run or fight you will get hurt, either mentally or physically. Since a double-edged sword has two “bad” sides you will get hurt either way. The book tells many different ways to handle a bully and/or fight. It also teaches ways to handle a mental problem. To get rid of a mental problem it says to think about it and to just let it “float” away. This book has helped me in my own experiences at school. Such as in gym I had just got done playing coyote ball and I went to sit down and counted my breath like it said and I calmed down and was all set for the next game. It is interesting that the chapter about being able to “bend like the bamboo” is something kind of like what my mother has always taught me. I have also learned from experience that it does work. It is a great skill and honor to be able to ignore and walk away from a bully. Overall this book taught me what to do in a fight and how to deal with a confrontation with a bully. I think this book was great and very insightful. When I read this book, I learned that karate is trying to stop a fight before it happens. If you learn self-defense, you gain confidence. Confidence is good and helps you get out of many fights. Karate means empty hands and I thought that was interesting. It also means Chinese hand in Japanese. Both these things I learned in the book. Zezen is a form of meditation that helps you clear your mind of thoughts. When you clear your mind you do not feel as stressful. To me Zezen is easy because kids usually aren’t as stressful as adults. I also learned that in Mukuso when someone hurts you, you just feel your anger and let it disappear. When you use this form you do not have to hurt someone else. I think you should use this at the appropriate time. I read what mind like moon and mind like water is. Mind like moon means you are aware of your enemy’s attacks. Mind like water means that your mind is calm. This is very useful if somebody is attacking you. I think kids and adults should read this book because it teaches you good and valuable lessons. I liked the book. I think it taught me some good and helpful things about karate. I would recommend this book to someone that was in karate and someone that wasn’t in karate, because I think it would teach them some very good values that someone could use in real life to defend or avoid themselves from a bully. I especially liked the part in the book when that one kid was sitting in the bullies seat and he talked the bully out of beating him up. I also liked the part in the book when the green belt had to spar a girl and lost because he thought he could beat her easily but it backfired and she beat him very easily because I think he was overconfident in himself and his strength. I really like chapter nine about role-playing. I think that was probably the part in the book I liked the most. 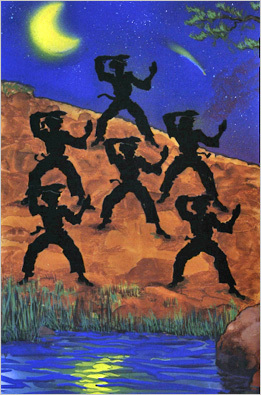 There was also another part in the book I really liked a lot and it was the first chapter and it is about kung fu. I think I got a lot out of it. In conclusion, I really liked this book. I think it was very educational for me and I think it would be educational for anyone who would happen to read this book.